Israel is five years old. His mother and father say he makes friends wherever he goes, but it’s a far cry from how his life started. At just five years old, Israel has spent more than four years in foster care. He was put into eight different foster homes, he was separated from his siblings and he was labeled difficult and “unadoptable.” At only three years old, the system gave up on him. But that’s not where Israel’s story ends. Thankfully, The Milner family came into Israel’s life as his foster parents. Lucky number 8. They say that they knew Israel was meant to be a forever part of their family and after nearly two years in their home, they could adopt him. 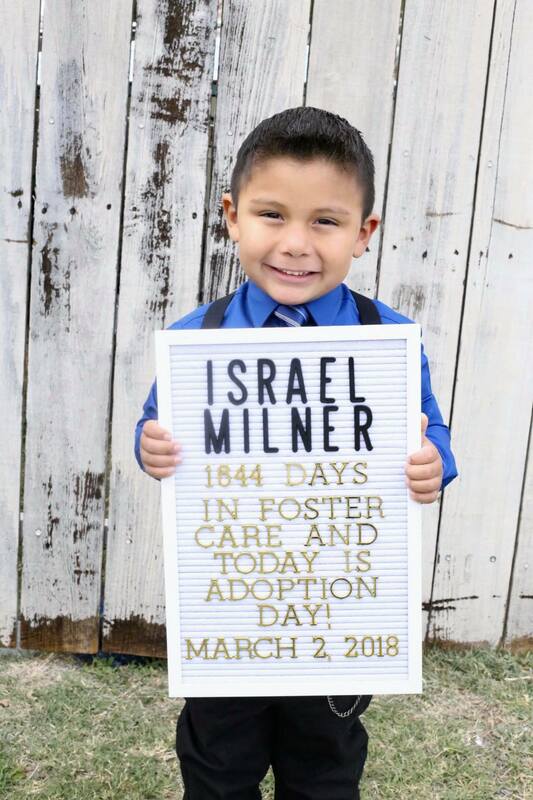 Israel’s adoption was finalized on March 2, 2018, after more than four years in foster care. This little five-year-old is now happy, healthy and living the life he deserves. “Israel truly completed our family. Foster to adopt has changed our whole family, and gave us all a bigger purpose, to love children who need forever homes,” said Israel’s mom. The Dave Thomas Foundation for Adoption believes that Unadoptable is Unacceptable. Help us find more forever families for the children who have been waiting the longest for a loving family.